Do You Know Your Hot Tub Chemistry? How do You Know When You Need a New Hot Tub Cover? If you are considering purchasing a hot tub and think you might want to buy a used one, keep in mind that this can be a risky and complicated proposition. Before you can make any decisions, you will need to know how to evaluate a hot tub in order to ensure that it’s in good condition and worth the money you’re paying for it. Read on to find out where to find reliable sellers and how to spot defects so you can avoid shock, disappointment, and financial loss. How will you move the spa to your house? Is the site prepared and setup with electrical wiring and plumbing? How will you clean or decontaminate the unit? Once you have answered those questions, you are ready to begin shopping. First, find some used hot tubs to evaluate. Look at classifieds in your local paper or on the local message boards of websites like Craigslist. Families are often forced to sell hot tubs when they move, and these can be good candidates for second-hand purchases. Online auction sites are not as good of an option as shipping is impractical and buying a used hot tub without inspecting it is risky. 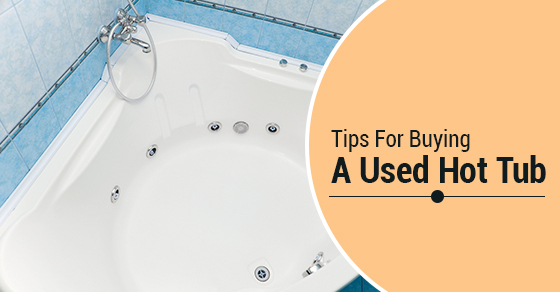 Avoid tubs that have not been used in a long time. Whether they have been sitting empty or simply have not been used, lack of proper maintenance can cause a host of problems that will make your purchase expensive or even impossible to fix. Before you begin inspecting a tub, ensure that it was filled with water and running for at least 24 hours. Begin by inspecting the spa shell and cabinet. Carefully check every inch of the shell for cracks, blisters, breaks, and any evidence of leaks. This shell is the vessel that holds the water and it vitally important to the unit. Repairs of the shell are often not possible or worth the effort, time, and money. Verify that the hot tub was only operated on level ground. If you cannot, it is possible that cracks may form in the shell after it is moved. With the spa running, ask the owner to show you how to operate the control pad. Change the functions and verify that the pump speeds, thermostat, and light are all operational. Check that the air valve operates across the full range: When open is should provide ample air injection to the jets. When closed, no air should get through. If there is still air being injected, the valve is defective. Although buying a hot tub used can be a viable option, you should think differently about buying a hot tub cover the same way. The cover is what protects your unit from dirt and debris, keeping your filter safe and the unit running smoothly. Buying a hot tub cover new will keep your used tub purchase running like new for years to come!